UPDATE: Congressman Jeff Duncan asked DHS chief Janet Napolitano about the Saudi linked to the Boston bombings being deported for “national security” reasons. Napolitano denied any knowledge of the man being deported. CNN also had to backtrack after they announced that a suspect had been arrested, a report that was subsequently denied by authorities. Reports of a “dark skinned man” being arrested were later mothballed. According to terrorism expert Steve Emerson, 20-year-old Abdul Rahman Ali Alharbi, the Saudi national first suspected of being involved in Monday’s twin bomb attack, is being hastily deported. Alharbi was put under armed guard in hospital after the bombing, was visited by Saudi diplomat Azzam bin Abdel Karim, and later had his apartment raided by federal and state law enforcement agents. “I just learned from my own sources that he is now going to be deported on national security grounds next Tuesday, which is very unusual,” Emerson told Fox News last night. The news follows an unscheduled meeting between President Obama and Saudi Foreign Minister Prince Saud al-Faisal at the White House yesterday afternoon. “The meeting was not on Obama’s public schedule,” reports Reuters. “That’s very interesting because this is the way things are done with Saudi Arabia. You don’t arrest their citizens. You deport them, because they don’t want them to be embarrassed and that’s the way we appease them,” Emerson told host Sean Hannity. The Alharbi clan has long been active in al-Qaida. Khaled bin Ouda bin Mohammed al-Harbi, for example, is a Saudi national who joined Osama bin Laden’s mujahadeen group in the 1980s. He reportedly became an al-Qaida member in the mid-1990s. He turned himself in to Saudi authorities in 2004 as part of an amnesty deal. The BBC reported Khaled Alharbi was married to the daughter of al-Qaida’s number two, Ayman al-Zawahri. He reportedly appeared with bin Laden in a video praising the Sept. 11, 2001, attacks. Given the fact that the Obama administration has sent more than half a billion dollars and the CIA is shipping weapons to FSA rebels in Syria who pledged allegiance to and are led by Al-Qaeda militants, the notion that one of these militants would carry out an attack on U.S. soil would be extremely damaging to the White House. Radio host Michael Savage floated the theory yesterday that the Boston police were told to cancel the press conference by the Obama administration and the FBI, because the Saudi Foreign Minister demanded that the suspect be allowed to leave the country. 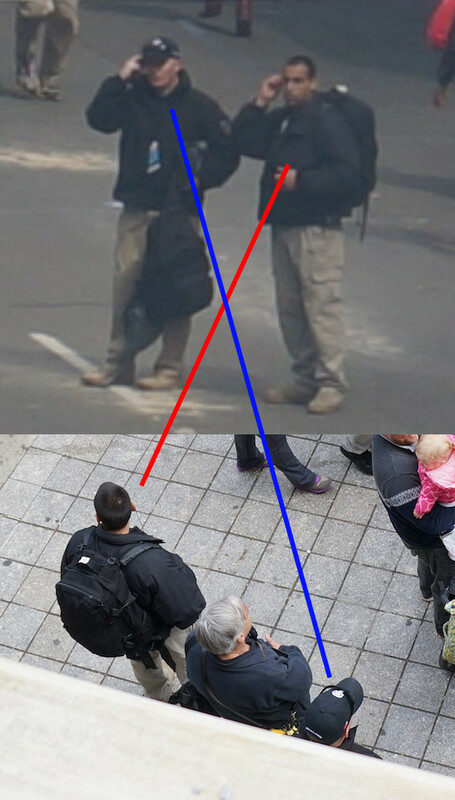 As Infowars first highlighted yesterday and as Anthony Gucciardi subsequently confirmed, two of the suspicious individuals identified on the scene of the Boston bombings wearing identical clothing and large black backpacks (one white, one darker skinned) are likely to be employees of Craft International, a Blackwater-style private military/security firm. Given that the bombs used in the attack were housed in black backpacks, remnants of which were found yards from the explosion, why are private security firm employees carrying black backpacks and talking on cellphones pictured within 30 feet of the blast just moments after it occurred? The men are certainly not marathon runners and they are not involved in rescue efforts. Who are these men? Did their identities being revealed yesterday cause the FBI to cancel its planned press conference? Were the men involved in the bomb drills before the actual bombings that were reported by eyewitnesses? Should it emerge that the Obama administration is shielding accomplices in the Boston bombings for political reasons, the scandal would dwarf the Benghazi attacks and inevitably lead to impeachment proceedings.